10 Broadcaster Press December 25, 2018 www.broadcasteronline.com DECEMBER 2018 VERMILLION.K12.SD.US VERMILLION HIGH SCHOOL’S STUDENT NEWSPAPER TyLER MANN WINS HOby AWARD by MASON COURNOyER A nd this year’s HOby Award goes to...VHS sophomore, Tyler Mann! The Hugh O’brian Youth (HOBY) program is exclusively designed for the nation’s high school sophomores in which all are eligible and encouraged to apply. To be recognized by such an esteemed program as this is truly an honor. The program’s purpose is to bring together all sophomores from across the country who have demonstrated a leadership ability and have them interact with groups of already distinguished and recognized leaders in business, government, education, and the recipient’s preferred future profession to discuss relevant issues in today’s global economy. Sophomores can apply by contacting the VHS Counseling Office. Applicants must write a 75-100 word essay with a topic that will be given once inside the Counseling Office. After all is said and done, an interview time will be set for the applicant to link up with a panel of members from the community. This panel is meant to select a HOby representative from the school. Tyler won the 2018 HOby Award which he was given a plaque to commemorate the achievement and will also be attending a 3-4 day seminar. The purpose behind this lengthy seminar is based on the Social Change Model of Leadership and to develop leadership skills from three perspectives: Personal Leadership, Group Leadership, and Leadership for Society. Awards such as the HOby benefit the youth and recognize their untamed potential to greatly improve the community in the future. Hoby Award Winner, Tyler Mann (sophomore) Photo by Mya DeJong (freshman) OH, GOOD GRIEF...(AND A HAPPY NEW YEAR) by TyLER MANN C hristmas music- some love it, some hate it (I personally fall into the second camp). However, I am sure plenty of people on both sides can agree that A Charlie brown Christmas is a great sound track to go along with a great movie. The album consists of soft jazz arrangements of classic Christmas tunes, as well as a originals composed by Vince Guaraldi, who also plays piano on the sound track. “O Tannenbaum” opens the album strongly, with its cozy, by the fire feel, perfect as a backdrop to Christmas morning or as a tune to wind down after a busy day of festivities. “Linus And Lucy” is the best piece considered. Its upbeat rhythm complements the iconic melody. The bass finally comes in after about a minute, a very satisfying moment. Following are two versions of “Christmas Time Is Here” including one with vocals and an instrumental version twice as long . I prefer the instrumental. Its longer form allows the somber mood to be fully fleshed out, and although the children’s choir is great, the piano as the main focal point works much better. “Skating” is a cute little piece. Versions of “Hark, The Herald Angel Sings” and “Für Elise” comes and goes rather quickly but not without leaving a pleasant impression. “The Christmas Song” closes the album rather beautifully, with its gentle, warm piano being the perfect send off. Truly, the best thing about this album (as a person who doesn’t like Christmas music) is it doesn’t feel like a Christmas album, despite having Christmas songs and being made for a Christmas movie. The tracks are performed, written and arranged well enough to make the listener forget that, and just enjoy the music for what it is: soothing, nostalgic and entertaining. 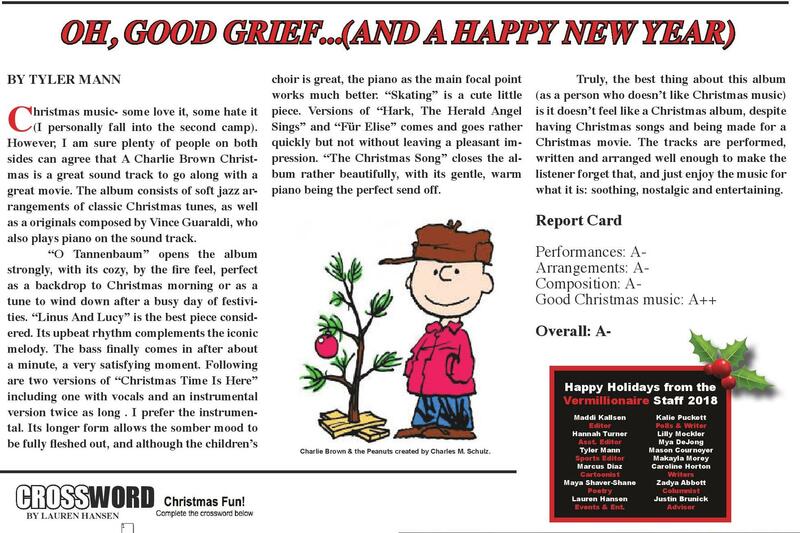 Report Card Performances: AArrangements: AComposition: AGood Christmas music: A++ Overall: AHappy Holidays from the Vermillionaire Staff 2018 Maddi Kallsen Editor Hannah Turner Asst. Editor Tyler Mann Sports Editor Marcus Diaz Cartoonist Maya Shaver-Shane Poetry Lauren Hansen Events & Ent. Charlie Brown & the Peanuts created by Charles M. Schulz. 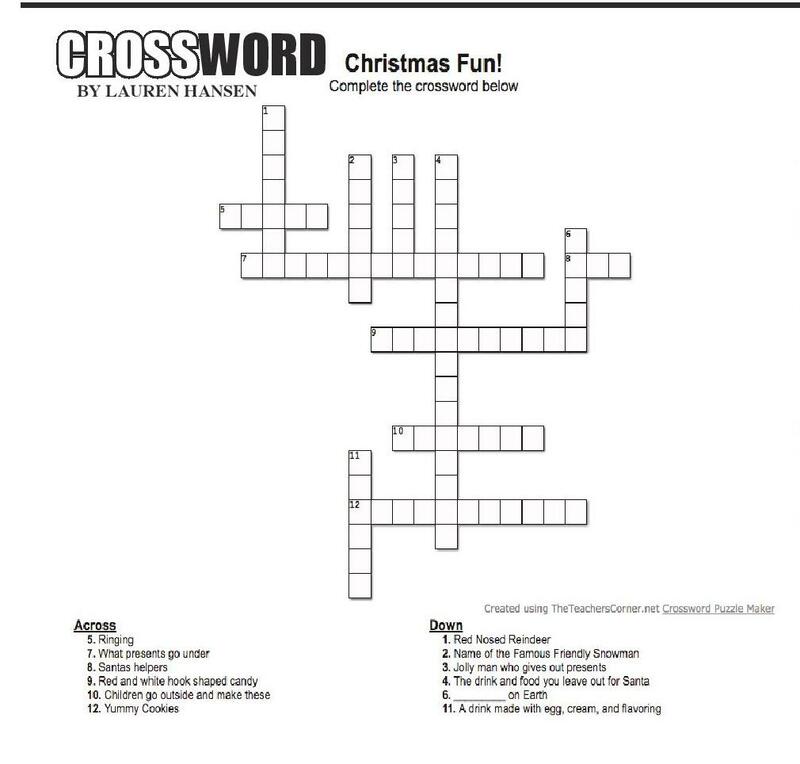 CROSSWORD by LAUREN HANSEN Kalie Puckett Polls & Writer Lilly Mockler Mya DeJong Mason Cournoyer Makayla Morey Caroline Horton Writers Zadya Abbott Columnist Justin Brunick Advisor I ? VISIT 14 OF THE TOP 15 MUST-SEE SITES IN WASHINGTON, D.C. High School Students Ru ra o l Join Us E tr i c by MARCUS DIAZ 40+ S.D. TEENS LIKE YOU! 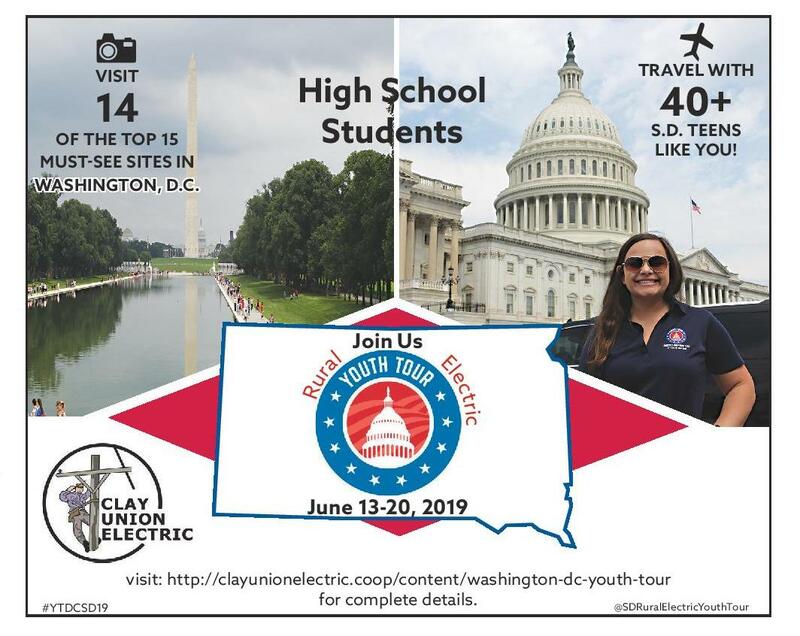 le c PAPER CLUB TRAVEL WITH June 13-20, 2019 #YTDCSD19 visit: http://clayunionelectric.coop/content/washington-dc-youth-tour for complete details. 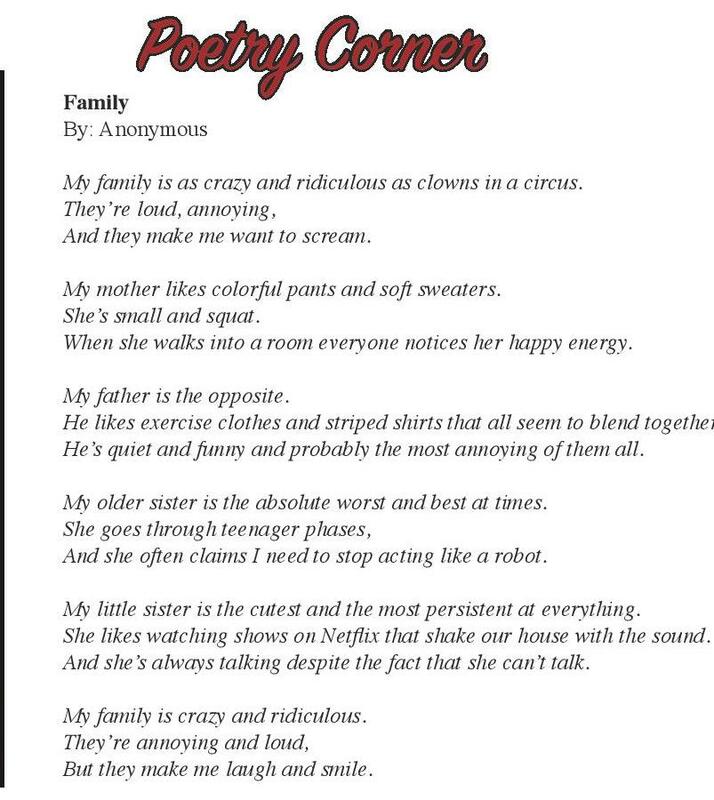 @SDRuralElectricYouthTour Poetry Corner Family By: Anonymous My family is as crazy and ridiculous as clowns in a circus. They’re loud, annoying, And they make me want to scream. Submit your poetry to the Poetry Corner by sending an email to Justin.Brunick@k12.sd.us My mother likes colorful pants and soft sweaters. She’s small and squat. When she walks into a room everyone notices her happy energy. My father is the opposite. He likes exercise clothes and striped shirts that all seem to blend together. He’s quiet and funny and probably the most annoying of them all. My older sister is the absolute worst and best at times. 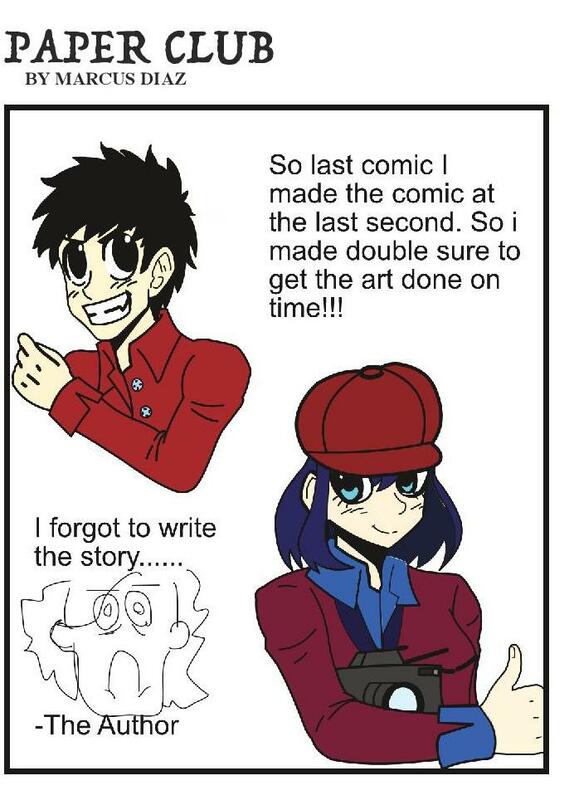 She goes through teenager phases, And she often claims I need to stop acting like a robot. My little sister is the cutest and the most persistent at everything. She likes watching shows on Netflix that shake our house with the sound. And she’s always talking despite the fact that she can’t talk. My family is crazy and ridiculous. They’re annoying and loud, But they make me laugh and smile. The Vermillionaire will be back in February! Thank you for a great First Semester!